I absolutely love the snow! I love to snowmobile, sled, and snowboard. I love waking up to a fresh blanket of new snow and the sparkle it makes in the sunlight. The only negative about the snow is that it’s so cold!! Unfortunately, I live in an area where it stays cold for many many months! We all get a little stir crazy around here being cooped up for so long. I’ve learned to get creative during these cold months to help us stay sane and stay in budget! 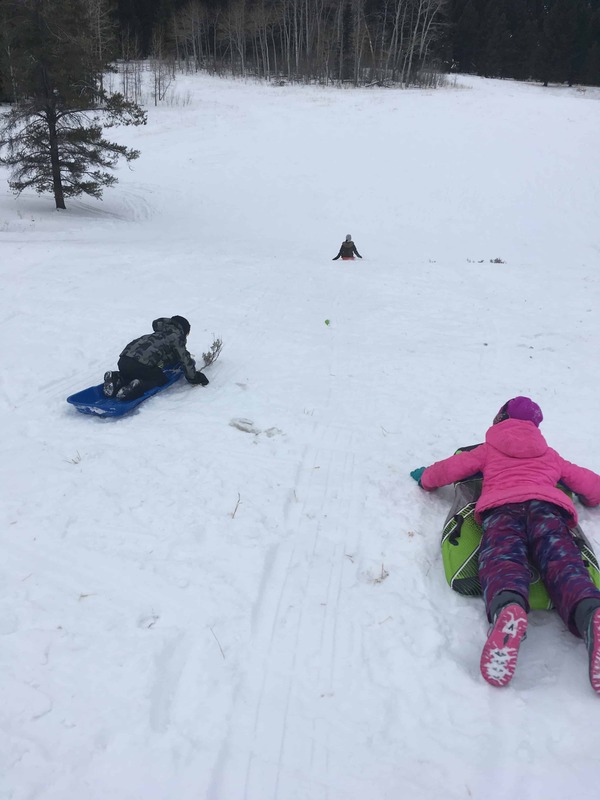 Try a few sledding hills around town. See if you can find a new favorite. Enjoy spending the day laughing with friends and family. Spend the day outside building a snow cave as a family. You could even have a contest to see who can build the best. Turn it into a castle, add some stairs or windows. Get creative and have fun! We fell in love with Snow Candy a few years ago after reading the Little House on the Prairie series. Simply place a bowl outside while it’s snowing. When the bowl is full of fresh clean snow, immediately bring it in and pour pure maple syrup on top. The syrup will harden to make a sweet treat! Bundle up and go for a walk in the freshly fallen snow. Make a game of it by putting together a list of different items to find; a pine cone, icicle, boot tracks, animal tracks, a snowman, etc. Have a family friendly snowball fight. This is guaranteed to bring a lot of laughs and memories! Why build one snowman when you can build a family of snowmen??? Have everyone build the snowman that fits their unique personality! Search Pinterest to find hundreds of easy snow ice cream tutorials. It is a simple recipe using a few cheap ingredients. This is a fun way to enjoy the snow…while staying indoors! Snuggle up together, pop some popcorn and have a family movie night. Watch a few old classics or try something new. All that matters is that you are spending time together. I love spending cold winter days in my kitchen baking something warm. Try baking a loaf of homemade bread! Lather it with homemade butter and eat it together as a family. 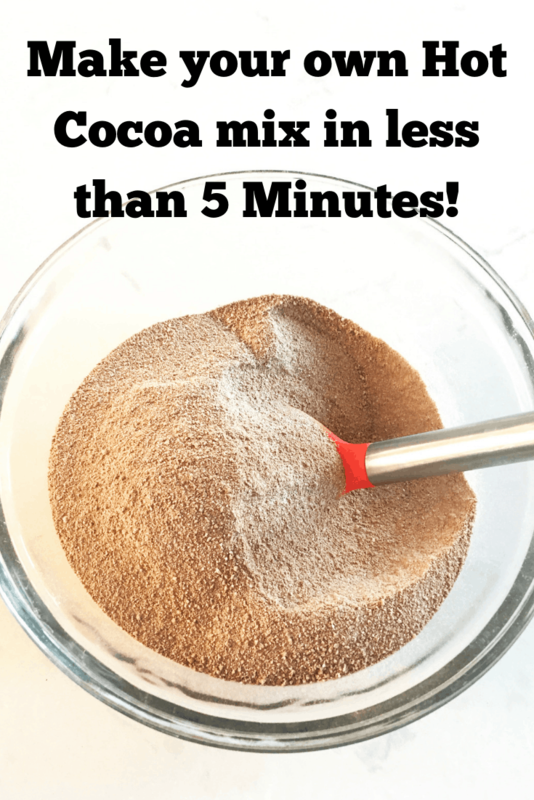 It only takes a couple of minutes and a few ingredients to make a big batch homemade cocoa. Make the hot chocolate together as a family and enjoy sipping it next to a warm cozy fire. Haul blankets, pillows and sleeping bags onto the living room floor. Have a large family slumber party together. Your kids will remember this forever! My family loves to read a novel together every winter. I usually pick a classic and read it to the kids for 20-30 minutes every evening. A few favorites have been Little House on the Prairie, Charlotte’s Web and Stuart Little. 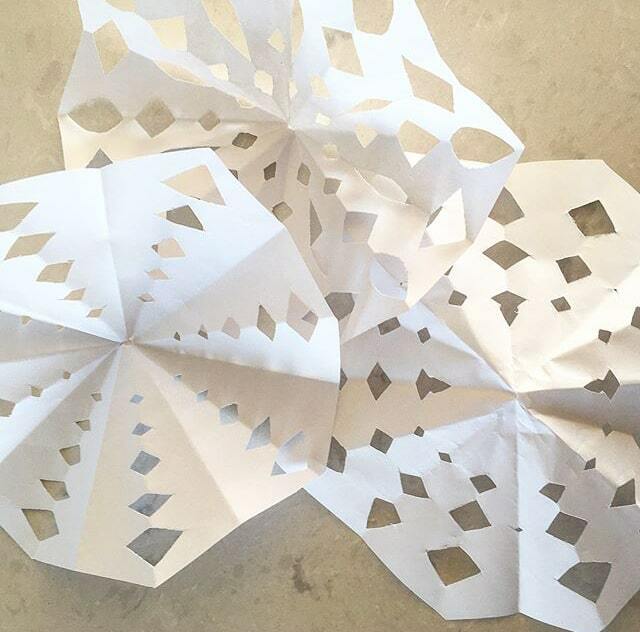 Spend an afternoon cutting out paper snowflakes and hanging them around your home. We like to tape a few to the windows and use invisible thread to hang some from the ceiling. You can find countless Youtube video tutorials. This is such a fun, cheap and easy craft! 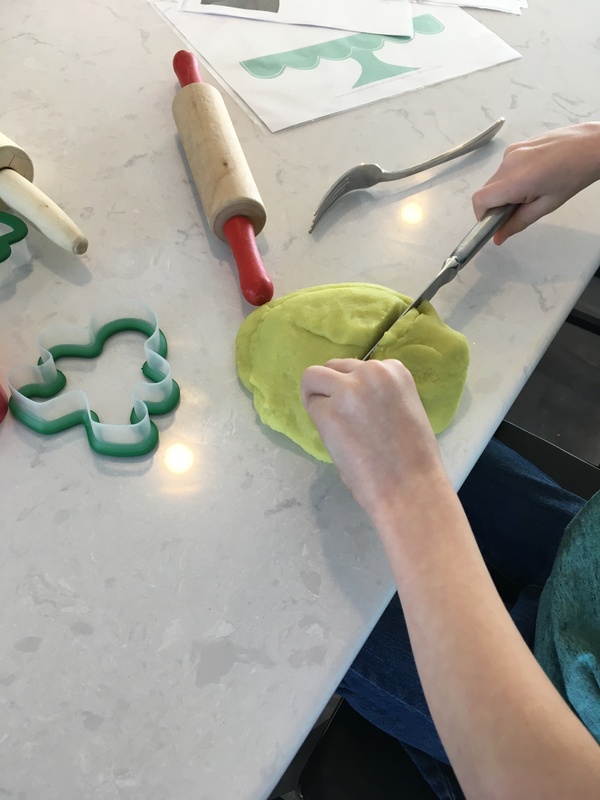 Make some homemade play dough at home! Use it to build snowmen or other fun creations. You can use my favorite recipe or search pinterest for other variations! You don’t have to have warm weather for a picnic! Spread a blanket out on the floor, bring a few of your favorite picnic foods and enjoy a picnic indoors! Gather all the blankets and chairs in your house and build a gigantic blanket fort. Play games, read stories and spend the day hiding out in the fort. 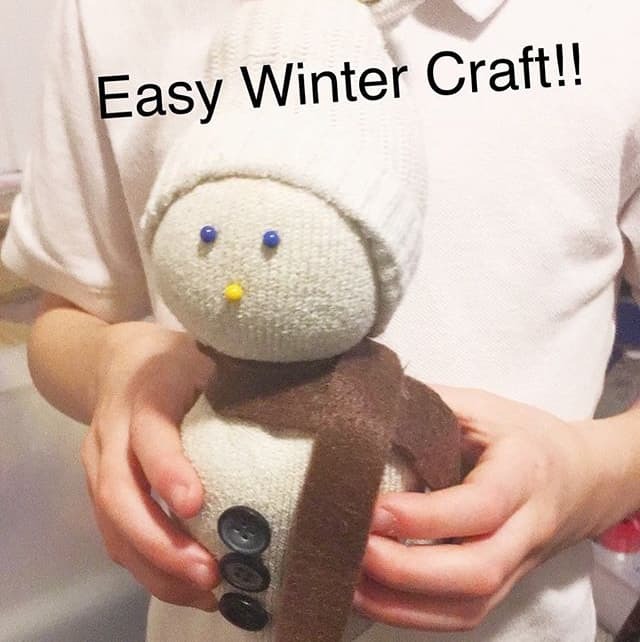 All it takes is a little creativity and a few random items found around the house to turn an ordinary sock into a snowman! We love board games in our family! You can find some cheap ones at your local thrift store, but there are plenty of fun games played with just a deck of cards or dice. My kids love spending an afternoon making friendship bracelets! You can do an easy braid or something fancier. Be sure to make two bracelets! One to give away and one to keep. Sometimes our family (or maybe just this tired mom! 😉 ) just needs a good old fashioned dance party! We crank up a few of our fave dance tunes and dance the grumpy faces away! 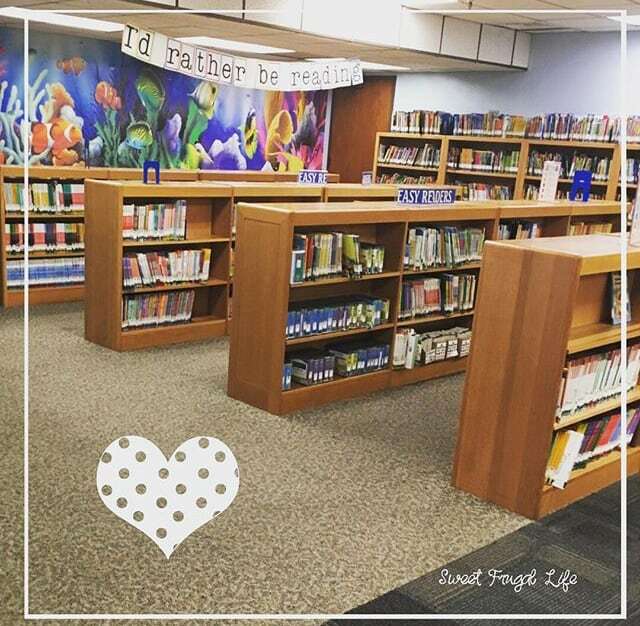 The library offers a lot of free activities for everyone in the family. Take advantage of all the many free programs and be sure to check out a book or movie while you are there! There is nothing better for a child to learn than how to care for others. Pick a day as a family to help serve a meal at the local homeless shelter. This is such a humbling experience! It’s so simple, but so fun! We love walking around the local pet store and visiting the cats, dogs, and birds. My kids ask to go regularly and I never complain! As a family go through all of the toys, clutter, and household items. Fill up a large box of items to donate to a thrift store. It feels so good to start the new year fresh and clutter free! Do you have an elderly neighbor who might need a visit? Or maybe someone new to the neighborhood? As a family pay a special visit to someone needing company. It’s a great way to brighten their day and get to know someone new! What do you like to do with your family during the cold winter months???? Bonus points if it’s FREE! Comment below with all your good ideas! great list! i grew up in Michigan and winters seemed to drag on forever! Happy New Year! 🙂 may this winter bring you lots of happy memories. These are all fantastic, and so many can be done any time of the year. My kids love having “movie nights” and “slumber parties’ during the day. it’s adorable. Pinning this for days when we’re bored and need something to do! I cannot thank you enough for creating this post. I live where winters can be harsh and stuck at home with kids is a sad reality. Thinking of ways to get out has been difficult, although I’m through most of the hard part of littles, it’s still helpful to know these ideas. Oh I’m so glad it was helpful to you! I love this list! 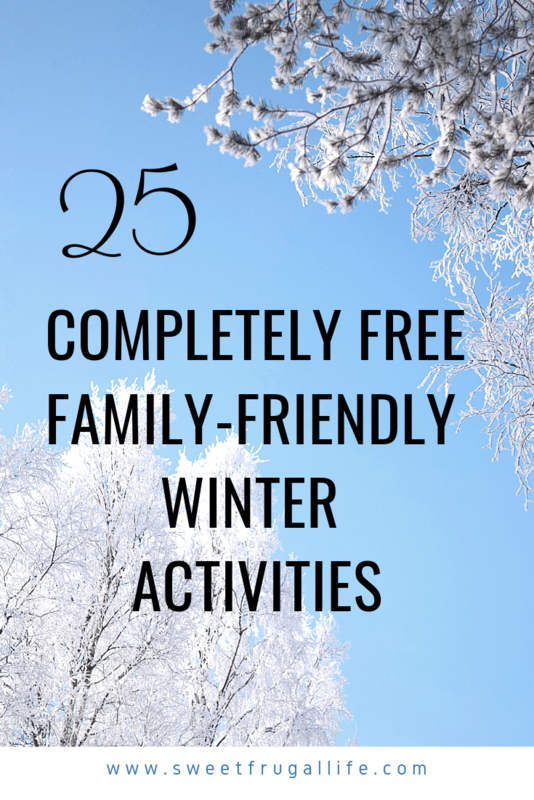 I especially love that all the activities are FREE and simple! Thank you! An indoor picnic is such a fun idea! These are great ideas, I have a toddler and live in a state with cold winters, finding exciting indoor activities can be challenging. I get it!! It can be hard! In the winter, our family loves to go sledding, skating and go for winter walks. Great list. I love that you included a mix of indoor and outdoor activities. We love having movie nights, especially in the winter, it’s great to curl up under some blankets and watch a great movie.